AVAproject Fusion is the ultimate extension to the AVAproject and AVAcad project family. It combines a state-of-the-art business intelligence engine with full featured report and pivot table creation tools. What makes Fusion truly exceptional however, is the facility it offers to allow seamless integration with virtually any accounting/ERP system. The breakdown of the modules is extremely straightforward; the following is the Fusion process overview chart that has been published since the first time Fusion was announced. Please note that in this version, three major areas have been highlighted. Each of these corresponds to an individual Fusion module. For many users, this module will be all they ever need. This powerful application forms the technological platform on which AVAproject Fusion is built. One or more AVAproject files can be brought into Fusion to be worked on. All the information contained in the projects is brought into a “Combined Information Pool” where each line of the Division 8 and 10 Material Lists is linked back to the Openings Schedules, Hardware Groups, Accessories, etc. from which it was created. Powerful data “Filters” can be created to extract, group or sort data based on ANY piece of data in the project. Reports can be created using ANY element of data from any or all of the lists and schedules that make up a project file. Reports can be grouped and sub-grouped by multiple fields. In addition, material can be bulked by ANY field. Pivot Tables, an extremely common business reporting tool found in products such as Microsoft Excel and Oracle are fully supported by Fusion. For those who are familiar with them, Fusion offers a Pivot Table facility that rivals those found in high-end ERP systems. Data grids, reports and pivot tables can all be printed or exported into a variety of standard data formats. Companies with internal I.T./development staff can utilize Fusion to prepare and export data for use in their own custom applications. Fusion is the only solution in the architectural openings industry that allows integration with virtually any accounting/ERP system. Even companies that have not yet chosen an accounting system can use this module on its own to prepare basic purchase and sales orders. Companies can implement Fusion with confidence that they will be able to integrate it with their choice of accounting system in the future. Fusion users always have the option of changing their accounting system should the need arise, without having to change their front-end detailing and estimating system. Before project data can be effectively passed to any accounting system, the data must be sorted and prepared in such a way that the target system can make use of it. This process is the same, regardless of what accounting system is being used. Basically, it involves separating all the various products called for in the project into multiple purchase orders based on vendors and delivery requirements. All pre-established deliveries and delivery dates relating to a given project can be maintained. With optional assistance from Fusion, each product in the project’s Material List is assigned to a vendor and a delivery. Based on these assignments, Fusion automatically generates a list of all the purchases orders required to source the products. Purchase orders are displayed on a “Purchase Order Schedule” that can be manipulated and customized just like the Openings Schedule or any other grid in AVAproject or Fusion. Purchase orders can be previewed, printed or exported as desired. 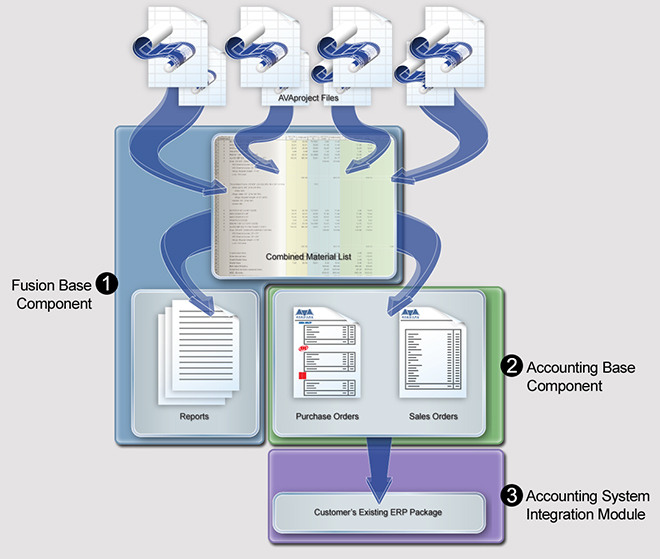 The final module that one may implement with Fusion is a system-specific integration module that allows accounting transactions (purchase orders and/or sales orders) to be moved directly into their existing accounting/ERP system. AVAware currently supports a number of popular accounting packages, with more being added to the list on an ongoing basis. If your specific accounting package is not currently offered, AVAware can possibly create an interface on a custom basis. Please Note: AVAware’s ability to create an interface to a specific accounting system will depend on the resources offered by that system’s developer as well as that system’s specific capabilities. For example, the accounting system in question must support the importing of data from outside sources. XML - In Plain English! For more information, click here to download the first draft of our AVAproject Fusion Theory of Operation document.